To complement Modineer’s full range of fabrication solutions, roll forming has become an integral part of Modineer’s valued capabilities. To add to Modineer’s extensive list of machine capabilities, we have 4 roll mills that range from 1.5” – 4” spindles. Our 54” Metform International LTD roll form mill is one of the few of its size, thus further expanding our broad-reaching machining capabilities. It is equipped with a coil car, die accelerator, and 100-ton mechanical cut off press. These features all assist in decreasing production time, lowering cost, and producing superior surface finishing with sharp and clean contours. Our roll mills are fully integrated with pre, middle, or post notch capabilities, In-line welding, sweeping die, and flying cut off. When roll forming is just the starting point for your complex bends, Modineer is equipped with a Pines bender, tube & angle bending rolls, and stretch bending units. Whether you need truck beds, corrugated siding, specialized commercial panels, small glass channels, or rocker panels, Modineer is your choice for all your roll forming needs. Sharp, clean contours can be maintained and reproduced to give a finished part right off the machine, without the need for additional finishing. Pre-punching in-line allows for holes, slots, or other cutout features to be cut into the part before forming. This eliminates the need for costly secondary operations. The Roll Forming process allows us to take the flat material and rolling it into hollow tubes and weld them together in one integrated process. Roll forming allows us to create parts that are longer than stamping would allow, as the machine can continually feed material down the line and be cut to length as required. Our roll form mills run anywhere from 30 feet per minute to 100 feet per minute. This allows us the opportunity to effectively handle a large volume of parts. Almost any material that will bend and hold a form can be roll formed. 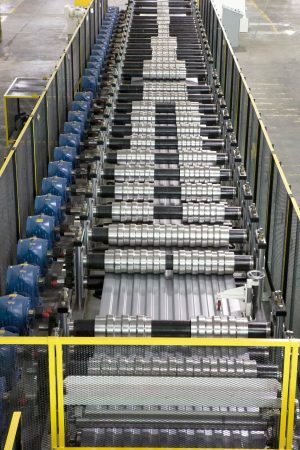 We currently roll form a variety of material types from soft aluminum to high strength martensitic material.